Guided Meditation Audio [AUDIO] – If you’re having trouble getting started with meditation, this free audio from the Portland Insight Meditation Community will guide you through the basic practice of mindfulness meditation. The site also offers additional guided meditation audios [AUDIO] for deepening your practice. Basic Relaxation Audios [AUDIO] from the Hobart and William Smith Colleges Counseling Center are free audio downloads to guide you through two different relaxation techniques – the Progressive Muscle Relaxation technique and the Combination Relaxation Exercise. For many additional free audio downloads, see The Mindfulness Solution [AUDIO] (Ronald D. Siegel, Assistant Professor of Psychology at Harvard Medical School) and Free Guided Meditations [AUDIO] (UCLA Mindful Awareness Research Center). The Allen County Public Library (Fort Wayne, IN) offers free online audios for Mindful Meditation [NEW!] and Gentle Yoga [NEW!]. Mindful.org offers a growing collection of free guided meditation audios [NEW!] [AUDIO]. The American Chronic Pain Association offers a five-minute online guided relaxation video [UPDATED LINK!] [VIDEO] designed to help you let go of physical stress. Stress Management – Explains how stress affects your physical & emotional health, and suggests a variety of techniques for controlling stress (American Heart Association). Physical exercise can also help reduce stress! Check out our Fitness, Sport, & Physical Therapy links for some good exercise resources. For additional mental health resources, check out our links to information about Mental Health, Self-Help, & Support Groups. The South Plainfield Library sometimes offers programs in yoga and meditation. Please keep an eye on the library’s website, library calendar, and/or our Facebook page for upcoming programs. 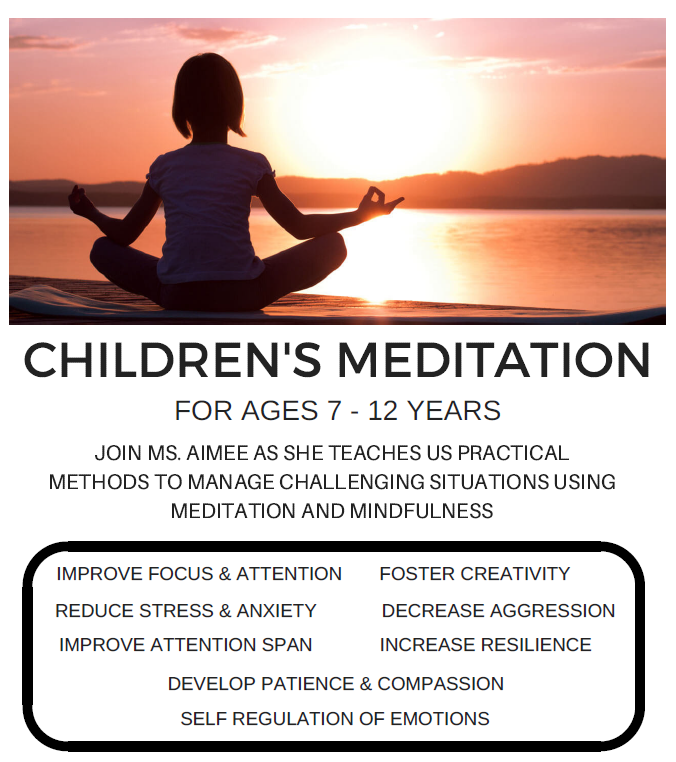 The South Plainfield Library sometimes offers CHILDREN’S MEDITATION for kids aged 7 – 12. Please check with the Children’s Room staff for schedule. Where to Donate Goods – Local, regional, and national organizations that can make good use of your used goods! Charity Scams – “If you’re thinking about giving to a charity, do your research to avoid fraudsters who try to take advantage of your generosity. Here are tips to help make sure that your charitable contributions actually go to the cause you support.” See also Charity Scams Follow Hurricane’s Wake [NEW!] (Federal Trade Commission). GiveWell – An independent, non-profit charity evaluator that assesses how well programs actually work, rather than focusing on financial factors. GiveWell is focused on finding “a small number of outstanding giving opportunities” rather than rating large numbers of charities. Click here to learn more about GiveWell’s evaluation process. GuideStar – ‘The donor’s guide to the charitable universe.’ A searchable database of 1.9 million U.S. non-profit organizations and foundations. Provides financial and management information derived from IRS Form 990 or IRS Form 990EZ. Includes links to each charity’s website, where available. Also offers Five Simple Steps to Better Giving, plus a blog for non-profit managers. NOTE: Free registration is required for full access. New Jersey Charities – Use this site to check on the status of charities operating within the state (New Jersey Division of Consumer Affairs, Charities Registration Section). For resources in other states, see NASCO (National Association of State Charity Officials). Too Many Solicitations? – Is your mailbox bursting with frequent requests for charitable donations? This page from Charity Watch offers help to reduce the flow, including a Fundraising Reduction Notice form you can send to organizations. For more advice on dealing with aggressive fundraisers, read Charity Navigator’s articles on How to Stop Solicitations by Mail and What To Do When A Charity Calls, Give.org’s advice on Telephone Appeals and Charity Mailing List Removal. Links updated October 28, 2018. Burn Wise – Information to help you choose EPA-certified wood-burning appliances (wood stove, pellet stove, hydronic heaters, fireplaces, and related products), and use them efficiently and safely (U.S. Environmental Protection Agency). Heat Pumps – Heat pumps can be a cost-effective alternative for heating and cooling your home. This site explains how to choose a heat pump to meet your needs. [NOTE: Some details on financing and installation are specific to Tennesee.] (Tennessee Valley Authority). The U.S. Department of Energy offers additional information on Air Source Heat Pumps and Geothermal Heat Pumps. NJ Rebates & Incentives, Energy Assistance and Related Programs (NJCEP) and NJ Homeowner Incentives for Clean Energy (Database of State Incentives for Renewables and Efficiency) – Information about available financing, rebates, and other incentives for energy-efficient home improvements. Seal and Insulate with ENERGY STAR – Instructions on installing weatherstripping on doors & caulking around windows, sealing air leaks, adding insulation, and other home energy conservation projects (U.S. DOE/EPA). See also Residential Insulation (Industry association : North American Insulation Manufacturers Association). Additional resources from USA.gov on Energy Efficiency, Renewable Energy, Tax Incentives, and more. American Indian Ancestry [Link opens a PDF document] – Printable guide to acquiring the genealogical documentation needed to establish descent from an Indian tribe for membership and enrollment purposes (2013, U.S. Bureau of Indian Affairs). See also Native American Records, which includes information about records at the National Archives, and links to many other useful resources (U.S. National Archives and Records Administration). Civil War Ancestors – Advice on researching ancestors who fought in the Civil War. The page’s link to the Civil War Soldiers and Sailors System (CWSS) was broken when checked in May 2017, but you can click here to access the CWSS database (National Park Service). See also Genealogy Notes: Civil War (2006, National Archives and Records Administration) and Civil War Research (FamilySearch.org). Ellis Island American Family Immigration History Center [FREE REGISTRATION REQUIRED TO VIEW RECORDS.] – If any of your ancestors came to this country through Ellis Island between 1892 and 1924, you can find out exactly when they arrived, and on what ship. Enter the name of the passenger in the Passenger Search box, and click on ‘Results’ to get a list of matching records. Family Tree Charts (Printable) – Choose one of three PDF charts to print and fill in with names and dates of your ancestors (ThoughtCo; part of the IAC family of websites. Formerly About.com. Site includes advertisements). See also family group sheets [Link opens a PDF document] & ancestor charts [Link opens a PDF document] (National Genealogical Society), and Library of Michigan Pedigree Chart [Link opens a PDF document]. Genealogy How-To Guide – An excellent step-by-step guide to researching your family history, from Genealogy.com (site includes advertisements). Genealogy Research Tutorials offers ‘simple tutorials that may answer some questions you have about getting started, gathering information from others, or turning professional.’ The tutorials are free, but include some references to publications for sale, and resources available only to members (National Genealogical Society). National Archives and Records Administration (NARA) – Explains what genealogy resources are available through the U.S. National Archives and how to obtain them. Covers census, immigration, military, and other records, plus FAQs, tips for doing genealogical research, preserving your family records, and more. See NARA’s Ethnic Heritage Resources for online resources specific to various ethnic groups, including African-American, Asian, British, Eastern European and Russian, Hispanic, Jewish, and Native American. Prologue Magazine offers Genealogy Notes on a range of topics such as African American History, American Indians, Immigration & Naturalization, Prison Records, and various wars. New Jersey Division of Archives and Records [UPDATED LINK!] – Searchable databases of marriage, death, & property records from the 17th – 19th centuries, military records, and other New Jersey historical records. See also New Jersey Genealogy (Rutgers University Libraries). NJ Digital Highway [UPDATED LINK!] lists New Jersey historical & genealogical societies, libraries, museums, etc., arranged by town or county (State of New Jersey). Includes links to websites, where available. See also Genealogy: Rootsweb N.J. Resources and Rootsweb websites: NJ [NOTE: Rootsweb was down when checked 4/18] . For resources in other states, see links to official State Archives in all 50 states, and USGenWeb (run by volunteers). Preserving Family Records – Information on how to preserve family documents, photos, memorabilia, and home movies (National Archives and Records Administration). For information on how to preserve items that have been damaged in a flood or other disaster, see Caring for Your Treasures (Heritage Preservation; non-profit organization). See also CCI Caring for Objects and ICON Caring for your Collection. Vital Records: Replace Your Vital Documents – USA.gov page offering information on ways to obtain copies of birth, marriage & death certificates, military service records and more. Battery Maintenance – Explains how to perform routine maintenance on your car battery, with clear illustrations. See also Troubleshooting a Car That Won’t Start (from the publishers of the For Dummies how-to books; site includes advertisements). Got a dead battery? Car Talk provides a printable illustrated guide to Jump-Starting Your Car (site includes advertisements). Car safety ratings – Results of crash tests on new cars, plus info on Shopping for a safer car and related topics (Insurance Institute for Highway Safety). See also SaferCar.gov (National Highway Traffic Safety Administration). Aging Drivers links offer helpful advice for older drivers and their families or caregivers. Gas Mileage Tips – Advice on how to your car in shape to save gas – and money (U.S. EPA / Department of Energy). See also Consumer Reports Fuel Economy Guide (some articles only available to subscribers), Saving Money on Gas (FTC), and Drive Green, Save Green (Port Authority of New York and New Jersey). Lemon Law (N.J.) – Stuck with a lemon? Find out what your rights are in NJ, and what remedies are available to you (N.J. Division of Consumer Affairs). BBB Auto Line Dispute Resolution Program offers a free online vehicle complaint form covering more than 2 dozen auto manufacturers, and includes links to lemon laws in all states (Better Business Bureau). The National Motor Vehicle Title Information System [NEW!] is designed to protect consumers from fraud and unsafe vehicles and to keep stolen vehicles from being resold. You can use it to access important vehicle history information. NIASE – The National Institute for Automotive Service Excellence website provides Car Care articles, Glove Box Tips, and a directory of certified repair shops. Tires – Advice on maintaining your tires for maximum safety, plus information on tire ratings and labeling (National Highway Traffic Safety Administration). See also How To Handle Tire Blow Outs (National Safety Commission). Winter Driving Tips (Car Talk) – ‘Tips to get ready for the snow and sleet-covered roads and dipstick-freezing temperatures.’ (NPR; site includes advertisements). See also AAA Winter Car Care Checklist. See also Winter Driving (State of New Jersey) and Summer Driving [NEW!] (National Highway Traffic Safety Administration).